Timthetatman is a notable Internet figure, who works as a full-time Twitch streamer. He is considered to be one of the most followed Twitch gamers of our time. He also has two YouTube channels where he hosts his gameplay videos on one of the channels, while the other channel is used for real life video blogging. 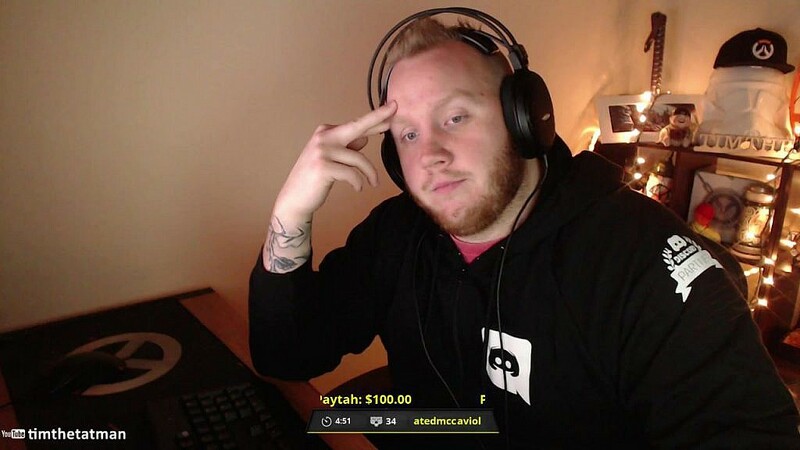 As a famous Twitch gamer, Timthetatman has amassed millions of followers and subscribers on the Internet, having over 1.2 million subscribers on his YouTube channels. He has also moved on to form collaborations with other top Twitch streamers such as Myth, Faze Tfue, Ninja, and DrLupo. The Twitch star is popularly known for his unique style of play notably in ‘Fortnite’, ‘Call of Duty’ and ‘Counter Strike’. He also created a website (imtimthetatman.com) where he thrills his fans with his gaming programs. Learn more interesting facts about the Twitch star’s life, career, earnings and personal relationship. The famous streamer was born as Timothy John Betar, in the United States on the 8th of April 1990. He was raised in Syracuse, New York. Sadly, his mother died when he was 15 years old, as a result of that, the tie between him and his father became stronger. However, further information about his parents as well as his siblings and education have not been made public to the media. The popular Twitch streamer started playing video games right from his young age when he was 13 and over the years, he transitioned to recording his own gameplay videos. He, however, began his Twitch streaming in 2012 and further went on to form a partnership with Twitch two years later. He is presently a full-time Twitch streamer, as he streams 6 days per week. Furthermore,Timothy has been able to amass more than 3,000,000 followers on Twitch who describes themselves as TatManArmy. His video games broadcast on Twitch include ‘World of Warcraft’, ‘Overwatch’, ‘Global Offensive’ and his recent game, ‘Fortnite’. Following the release of his ‘Fortnite’ gameplay video in July 2017, Timthetatman’s streaming views escalated. Consequently, his growing popularity leveled up with top Twitch streamers such as Tfue and Ninja. The skillful gamer also released ‘Fortnite’ highlight in 2018, and this earned him much public recognition as he is being rated as the most thriving ‘Fortnite’ player. The internet personality further stepped up his game and started uploading videos created in the form of montages and updates to his self-titled YouTube channel in 2013. The first gameplay video he uploaded was titled, Call of Duty: Black Ops 2, with his montages being displayed as scopes, quickscopes, and others. Later on, John added to his YouTube channel the ‘Overwatch’ video game. Having joined the social media platform since 2013, Timthetatman has gathered enormous fans as a result of his extraordinary gaming skills and unique montages which have earned him about 1.2 million YouTube subscribers, with over 111,000,000 video views. In addition, he also makes real life video blogging on his YouTube channel called Thirteen Wolves. Timthetatman has been sponsored over the years by some prestigious companies such as Cyber PowerPc, Razer Inc., Monster Energy and Audio-Technica. The renown gamer, together with his fellow streamers carried out a philanthropic act in 2018, by raising fund for St. Jude’s Children Research Hospital. Eventually, they raised over 2.7 million for the project. During that time, Timthetatman broke Twitch philanthropic donation record as he was able to raise over $106,000 in 4hours on his Twitch time block. More so, he also featured alongside fellow streamer – Ninja and other NFL superstars such as Peyton Manning, Marshawn Lynch in the NFL 100 commercial titled 100-Year Game during the NFL Super Bowl LIII. In December 2018, during the premiere of The Gamers’ Choice Awards, Timthetatman was honored for his amazing contributions in the video game industry as he clinched the award for Fan Favorite Male Streamer/Gamer of the Year. The notable internet figure has been active as a streamer for the past seven years and he has gone ahead to release multiple of works as a gamer and streamer on his different online channels. Timthetatman has from all these earned enormous wealth. His financial value is estimated to be over $1 million. The award-winning gamer met his wife Alexis, who has been featured severally on his streams, at high school. The couple courted for sometime before getting engaged on 20th Decdmber, 2015. Later in the following year, the pair solemnized their union and they are expecting the arrival of their first child, a son, in 2019.